Anyone else obsessed with matcha? If you’re reading this and thinking what on earth is matcha (have you been living under a rock?) it’s basically strong green tea powder which boasts a long list of health benefits. Matcha is grown in the shade for 20 weeks before being harvested, which boosts its levels of chlorophyll and catechins. It’s then ground into a powder, so you consume the whole leaf as opposed to the water of a green teabag. It’s the perfect alternative to coffee as the caffeine is released at a slower rate so avoids the “crash” later on. 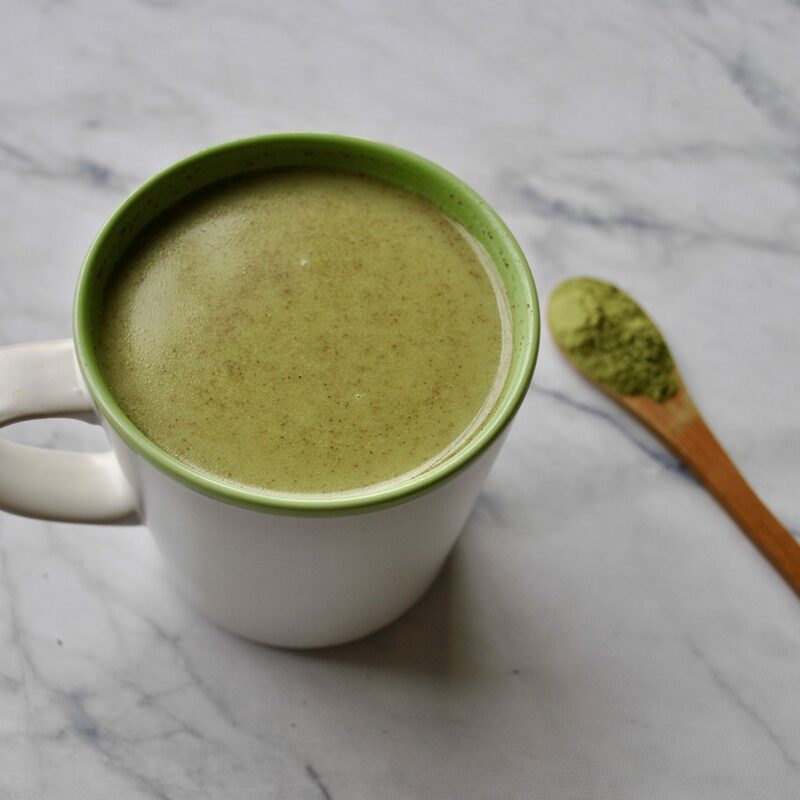 Cinnamon Matcha Latte – A nourishing and antioxidant-rich replacement to coffee, leaving you calm with a gentle buzz. Matcha, Mango & Spinach Smoothie – The mango gives a tropical sweet base, while the spinach adds a vibrant green colour! 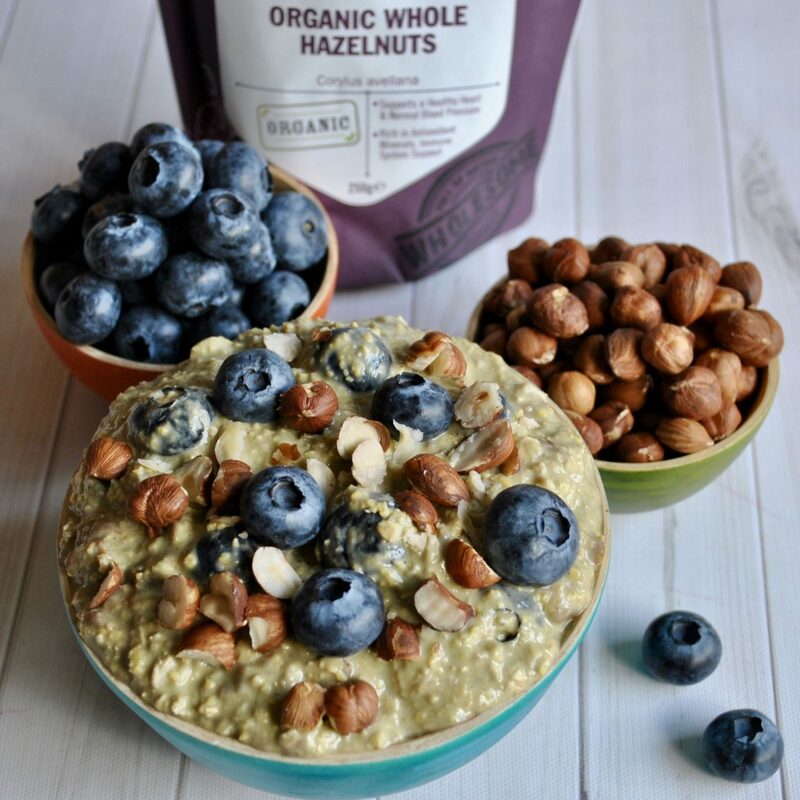 Matcha Blueberry Overnight Oats (recipe below!) 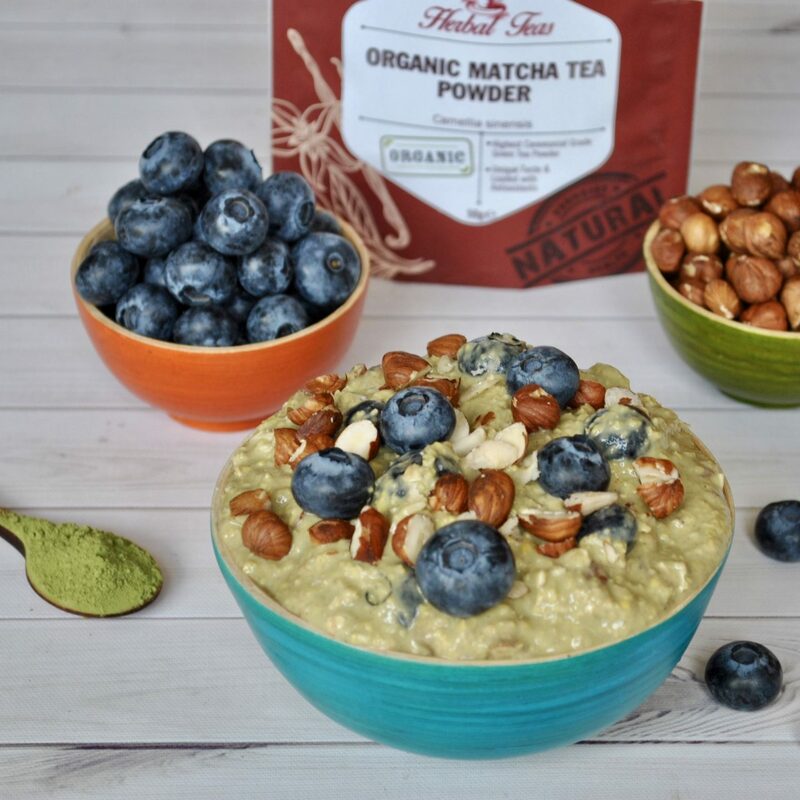 – These thick and creamy Matcha Overnight Oats take less than five minutes to prepare. All you need to do is stir together all the ingredients, refrigerate overnight and grab-and-go in the morning! Plus, it’s sweetened naturally with just a ripe mashed banana. This recipe was developed in collaboration with Indigo Herbs using their ingredients. Mash the banana with a fork, then stir in all other ingredients until fully combined. Cover and refrigerate for at least 2 hours, or overnight. Remove from the fridge, place in two glass jars or bowls, and top with remaining blueberries, hazelnuts and a drizzle of honey or maple syrup. Alternatively, heat it up over the stove or in the microwave for a warming 2-minute breakfast! 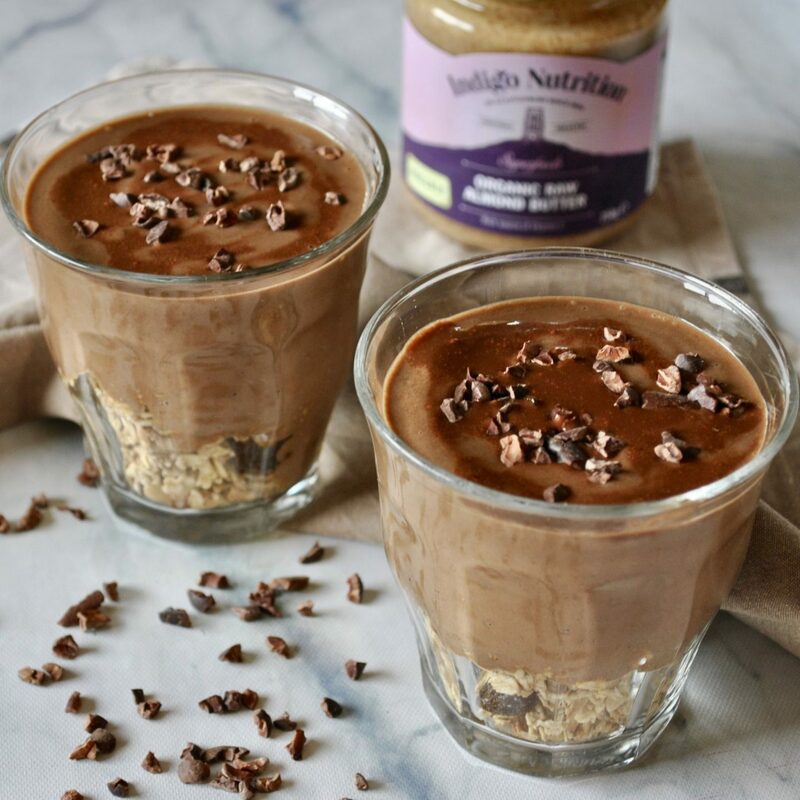 If you make this recipe, don’t forget to tag me on Instagram @cerealandpeanutbutter – I LOVE seeing all your creations! Don’t forget to check out my other matcha recipes: Cinnamon Matcha Latte and Matcha, Mango & Spinach Smoothie. 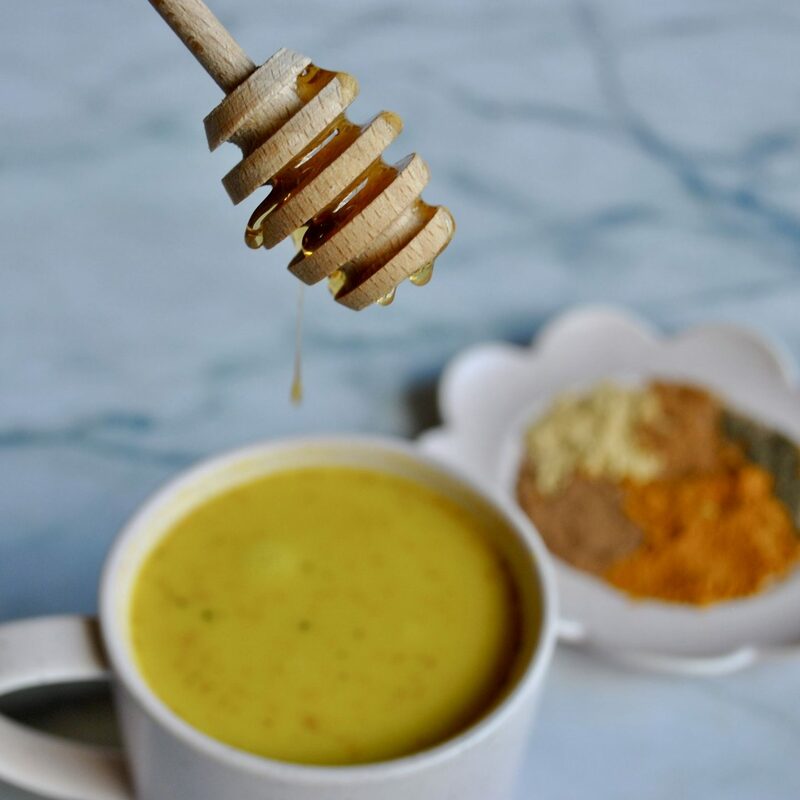 As well as giving curries that gorgeous yellow/orange hue, it’s no secret that turmeric is one of the most potent spices when it comes to health benefits, due to its active ingredient, curcumin. 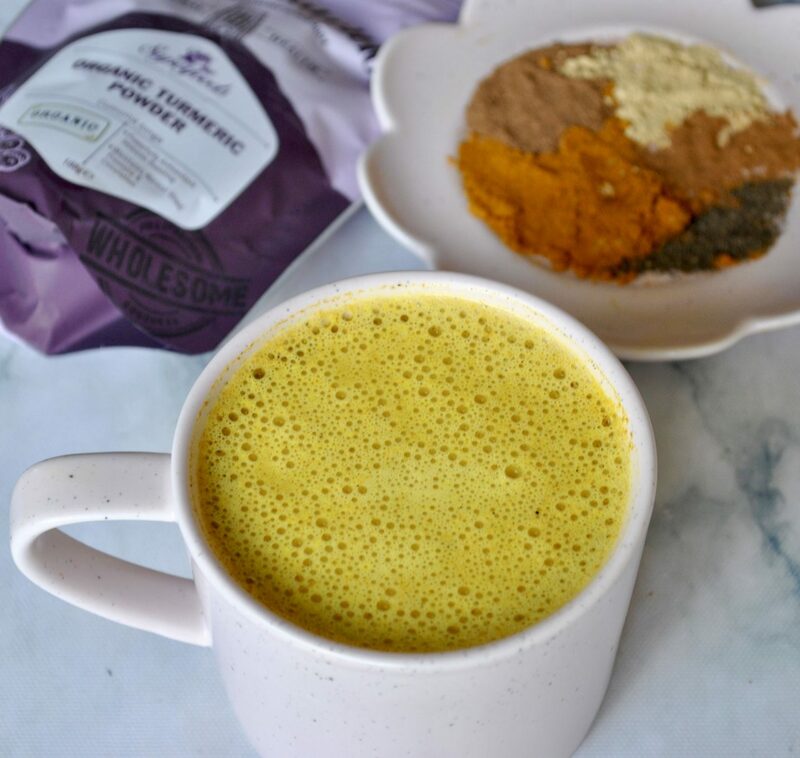 4 reasons to add turmeric to your diet today. 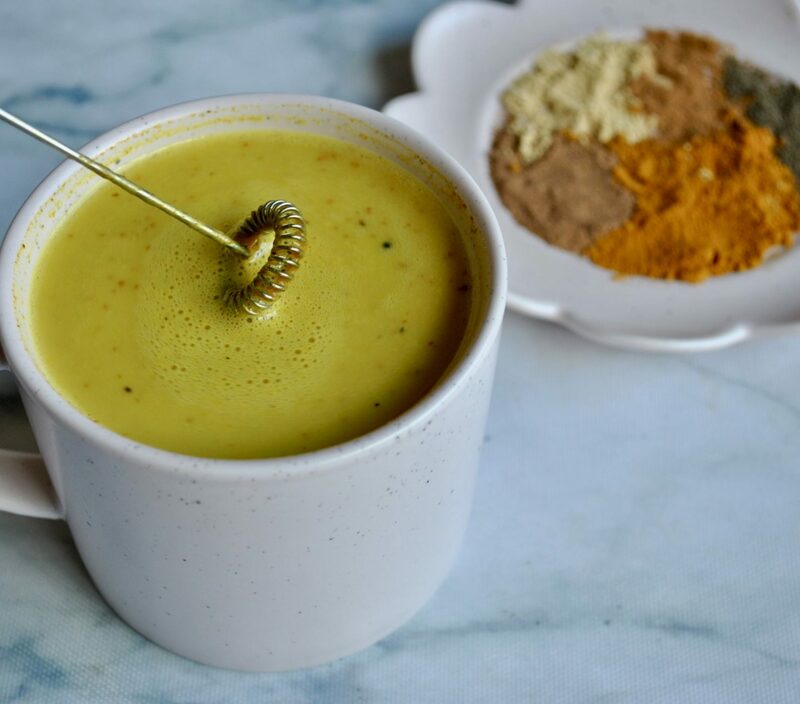 It may sound like a big claim, but scientific studies have shown that curcumin helps to inhibit inflammation in the body, and research suggests that it could be used to prevent and treat chronic diseases, from diabetes to cancer! By neutralising free radicals in the body, turmeric acts as an antioxidant. 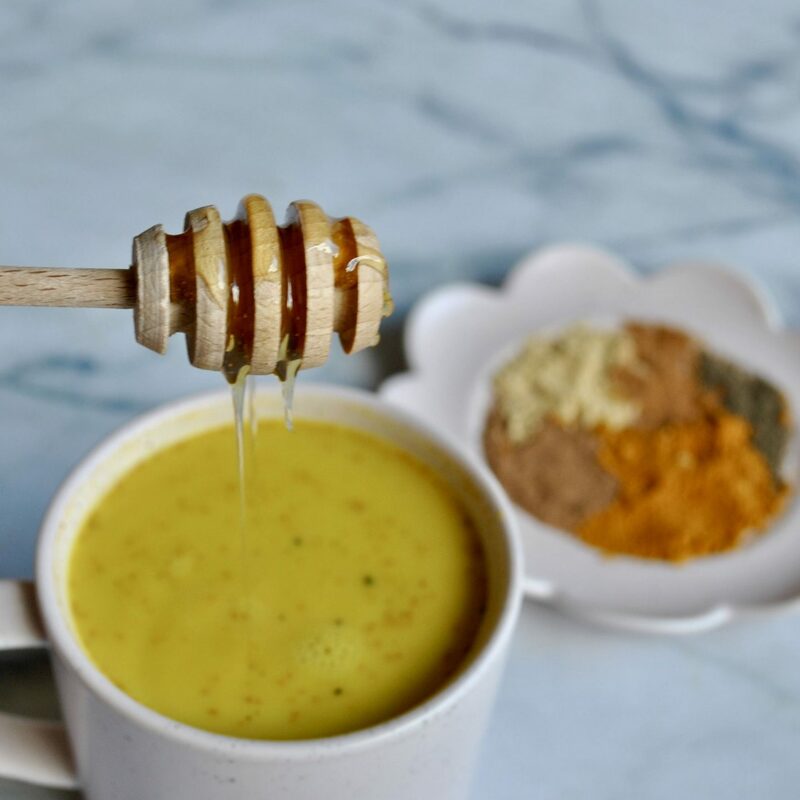 Now I’m not suggesting that turmeric is the answer to the world’s health problems, but it can do no harm to add this delicious and highly research anti-inflammatory spice into your diet! Curcumin is especially beneficial in auto-immune conditions (those that affect the immune system), including multiple sclerosis, rheumatoid arthritis and inflammatory bowel disease, as shown in this promising study. Another incredibly exciting study shows the effectiveness of turmeric in fighting depression, by boosting levels of serotonin and dopamine in the brain, and so acting as an antidepressant! Research also shows that consuming turmeric with black pepper (bioperine) increases its bioavailability (absorption in the body) by 2000%. That’s right – two thousand per cent! It has also been proven that curcumin is a fat-soluble substance so it should be consumed with a meal that contains healthy fats, such as coconut oil, avocado, nuts or eggs. So what are you waiting for? Go on and sprinkle some turmeric all over your life! 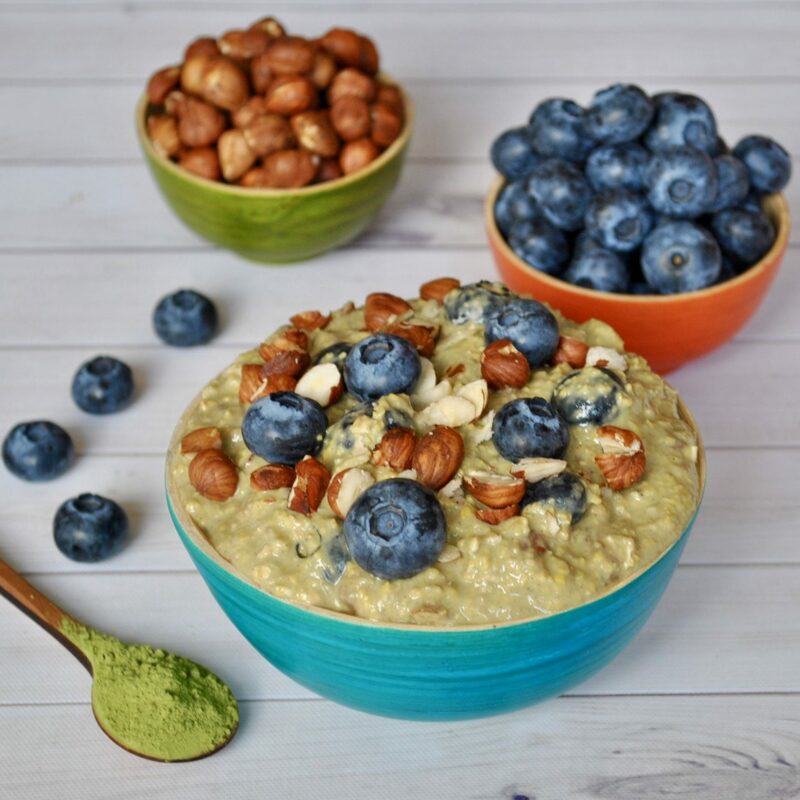 Add it soups, curries, smoothies and Indian Lentil Dahl, or get creative and make this Turmeric & Goji Porridge… just be careful not to stain your clothes with it – I learnt the hard way! As well as the star of the show, turmeric, the other ingredients offer an array of benefits too. Ginger has been known to sooth the stomach, whilst cinnamon has been glorified for stabilising blood sugar levels. Nutmeg helps detoxify the kidney and liver, and stirring in a dash of coconut oil boosts the omega-3 content, and adds to the incredibly smooth melt-in-your-mouth texture. 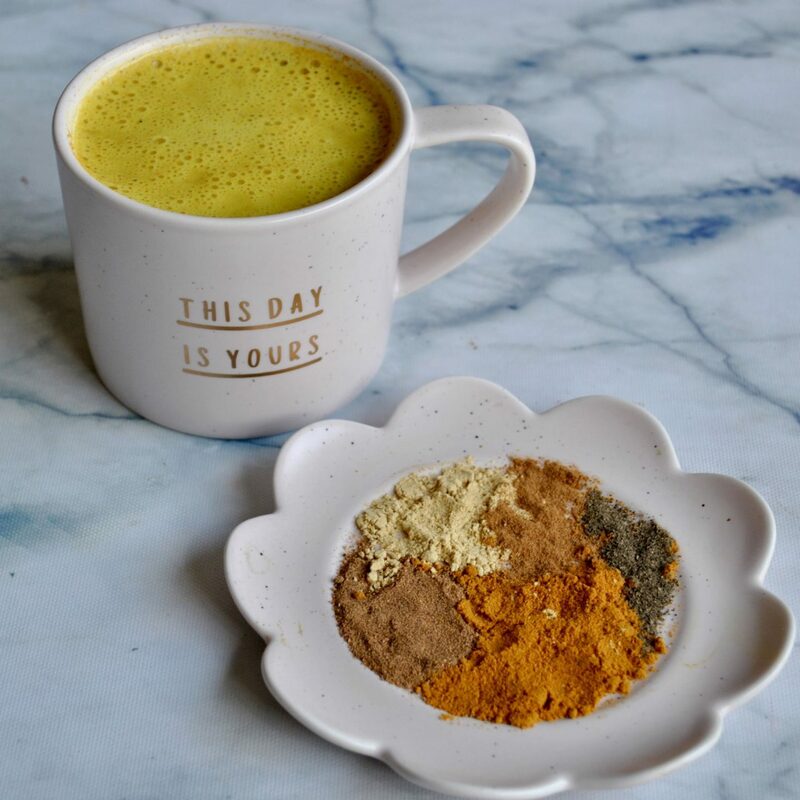 If you want to give some of my other nourishing hot drinks a go, be sure to try my Cinnamon Matcha Latte and my Brain-Boosting Hot Chocolate with Magic Mushrooms – you’ll love them! Warm the almond milk in a saucepan but do not boil. Stir in the spices, coconut oil, vanilla and honey/maple syrup. Whisk together (I used a wired whisk) to create a frothy foam (you can transfer it to the blender for a few seconds if you don’t have a whisk – or feel free to skip this step entirely). Pour into a mug and sprinkle with a pinch of cinnamon. 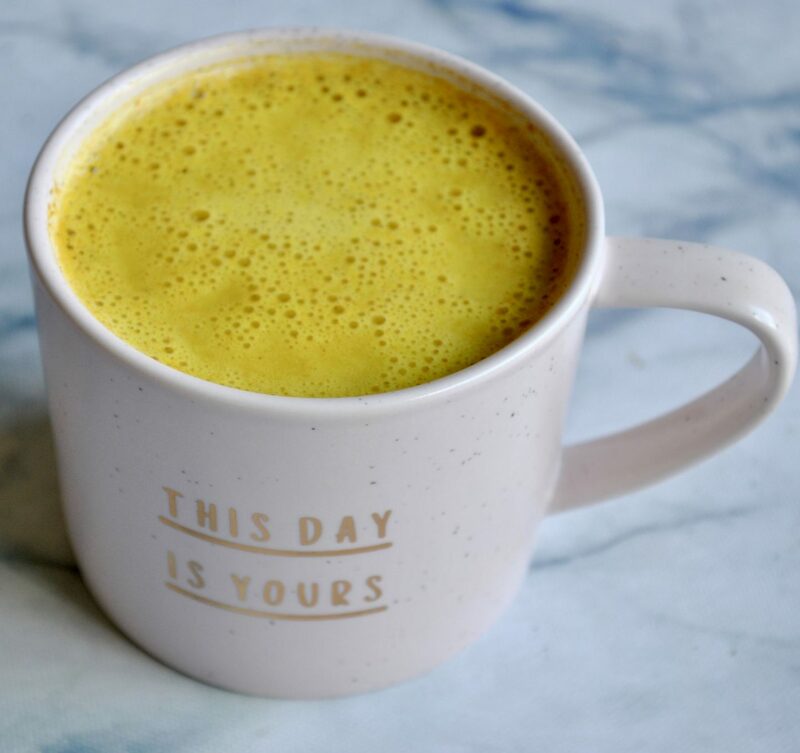 Have you ever tried a turmeric latte? Let me know in the comments, and if you give this a go make sure to tag me on Instagram @cerealandpeanutbutter so I can see your creations! 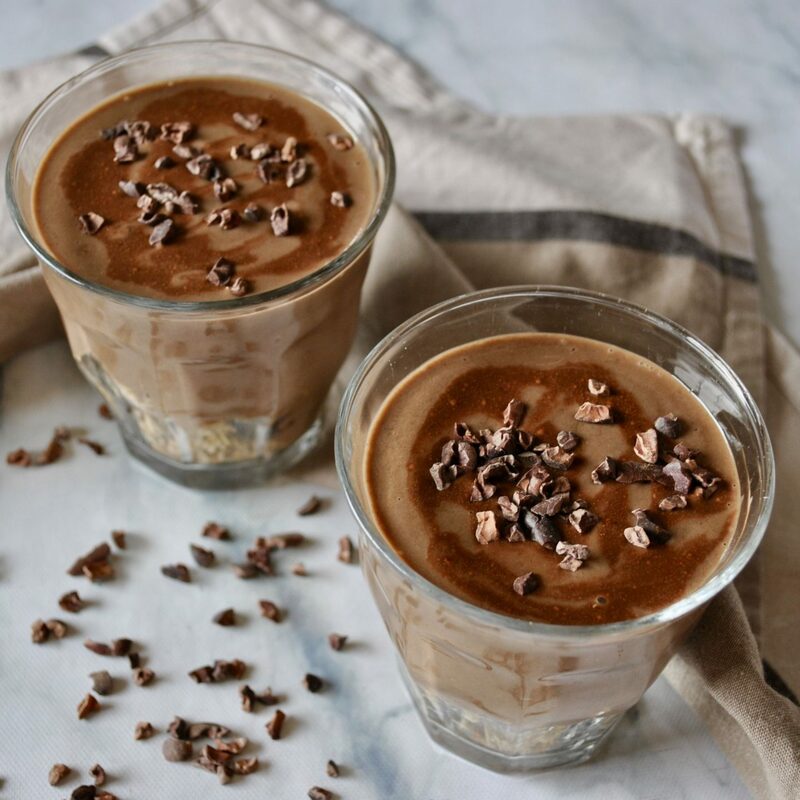 For more delicious hot drinks, check out my recipe for Cinnamon Matcha Latte and Brain-Boosting Hot Chocolate. For more turmeric recipes, try my Indian Lentil Dahl and Turmeric & Goji Porridge. 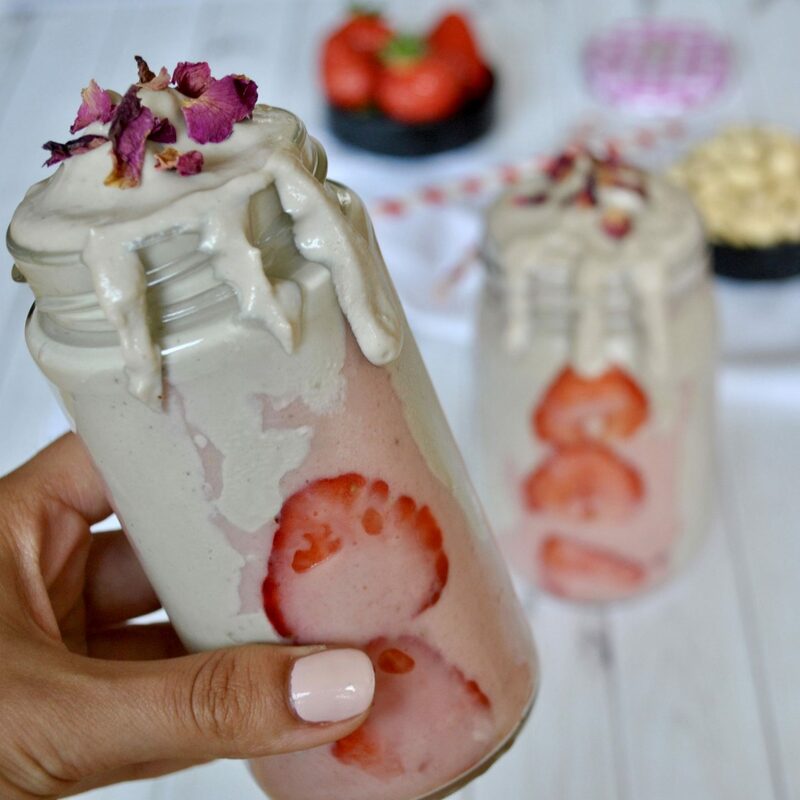 However, I spent a while playing around with natural alternatives and discovered that frozen bananas provide the perfect base for “milkshakes” as they are naturally sweet and creamy, while coconut flour is a fantastic thickener which boasts health benefits such as being high in fibre and essential heart-healthy fats. 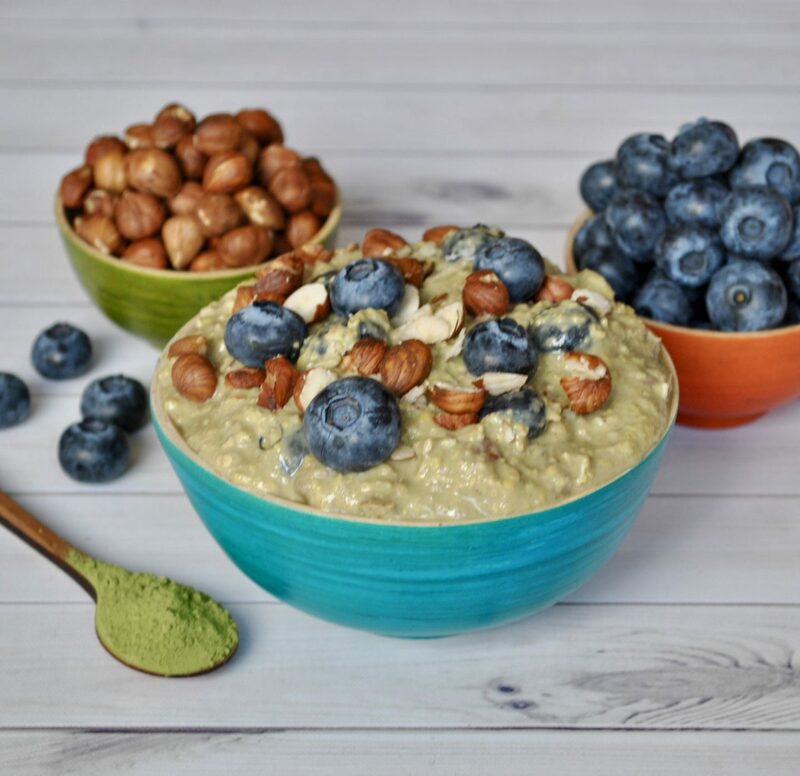 A spoonful or two of nut butter helps bind everything together, and a scoop of protein powder makes it extra filling and helps to curb your sugar cravings. 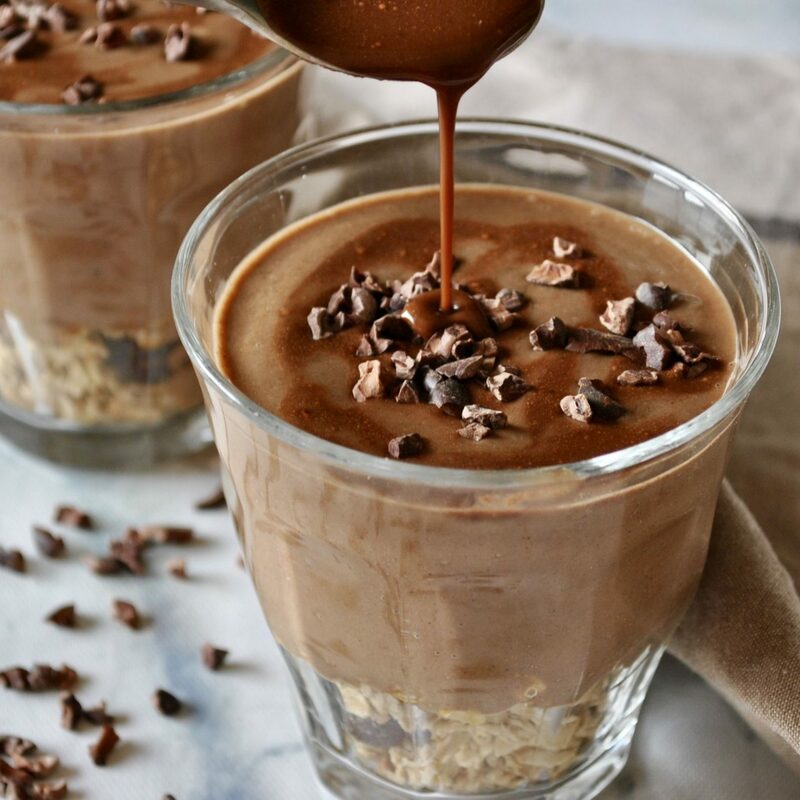 The “mocha” element comes from a combination of coffee with chocolate – or raw cacao powder to be specific – which is full of minerals like magnesium and a natural stimulant, making it the perfect way to start your day on an energising note! 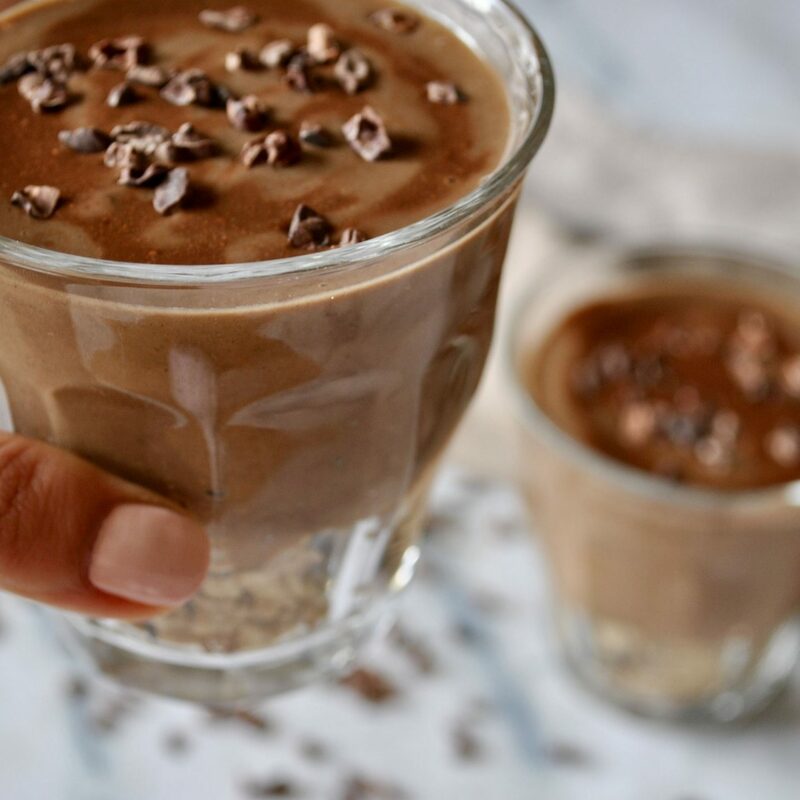 Make sure you check out my other smoothie recipes (all are vegan), like this Strawberries and Cream Smoothie, these Top 3 Green Smoothies, this Mint Chocolate Chip Smoothie and this Chocolate Peanut Butter Cup Milkshake. Simply blend all ingredients for the shake together until completely smooth and pour into a glass. Combine all ingredients for the sauce in a small bowl and whisk until fully combined and no lumps remain. 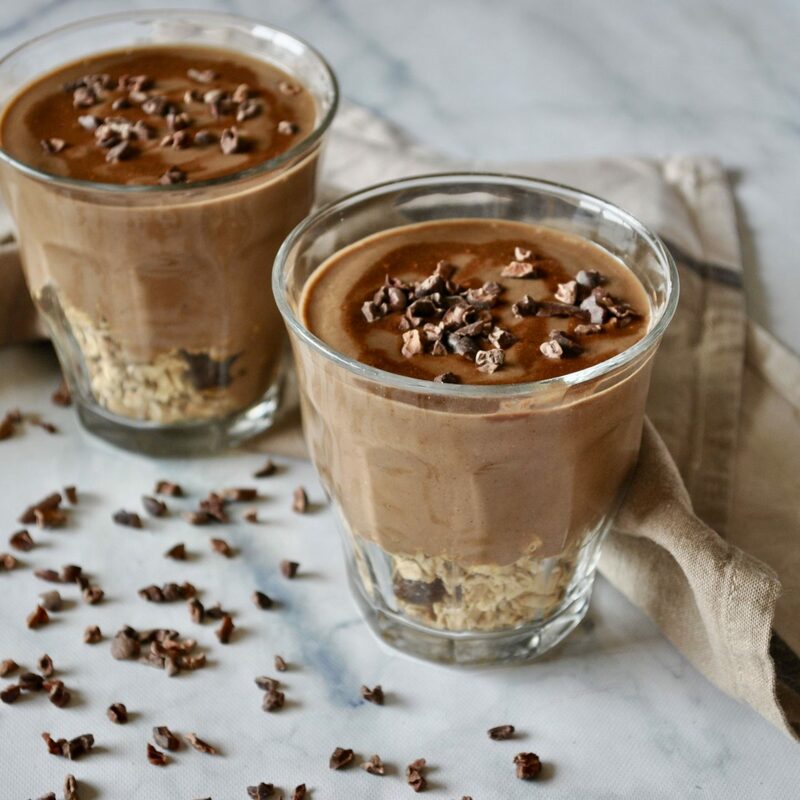 Pour sauce over the smoothie, garnish with cacao nibs, and serve immediately. I’d love to know if you try this recipe! Leave a comment and rate it, and be sure to take a picture and tag me @cerealandpeanutbutter on Instagram! 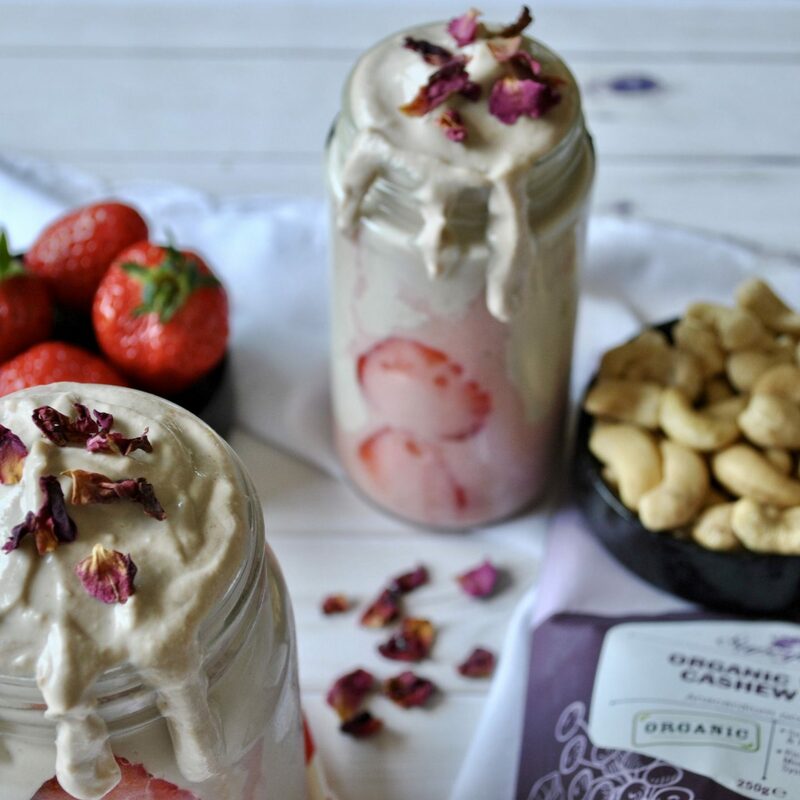 Strawberries and cream go together like peanut butter and jam, or peanut butter and chocolate, or peanut butter and pretty much anything… but back to this smoothie – it is delectably tasty, made from completely natural ingredients and 100% vegan. It takes just a couple of minutes to whizz together (provided you’ve soaked the cashews), and if you’re anything like me, half of that time to guzzle down! 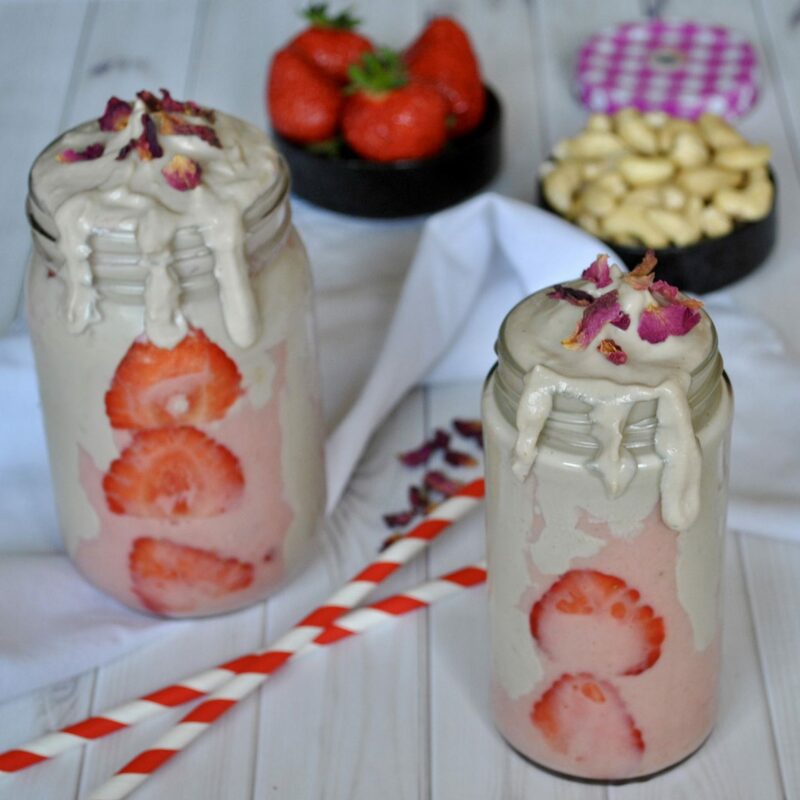 With the consistency of an irresistibly thick shake, this Strawberries and Cream Smoothie gets it’s creaminess from the cashew nuts which have been covered in water for a couple of hours to soften them. This makes it a more hearty and substantial breakfast which will keep you fuller for longer. 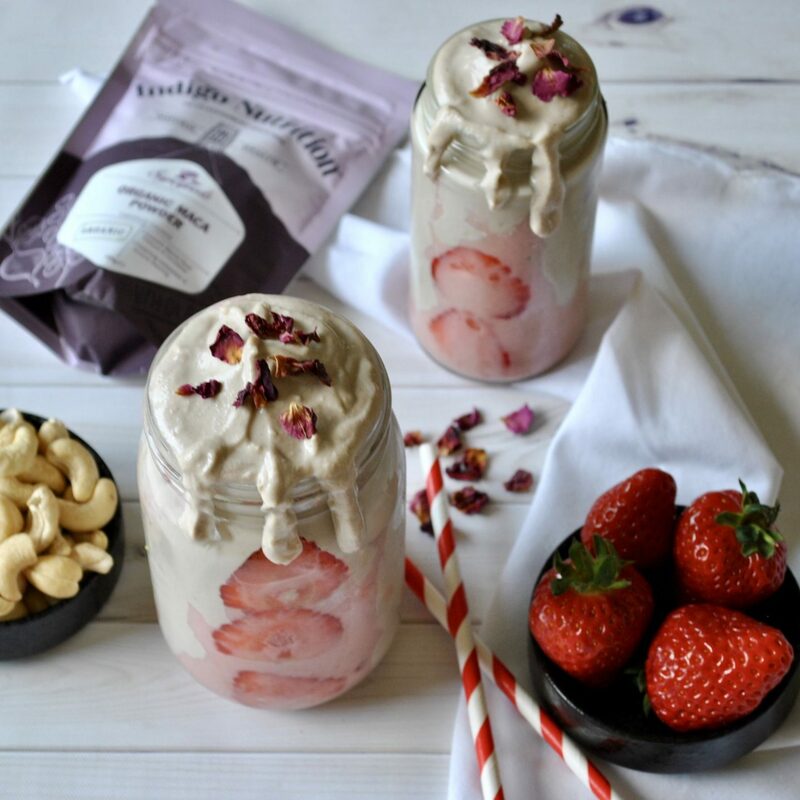 From a nutritional perspective, the smoothie is bursting with wholesome ingredients such as Vitamin C-rich strawberries, gut-loving yoghurt (thanks to the probiotics), hormone-healthy maca powder (which gives a slight caramel taste) and magnesium-packed cashew nuts. Adored by kids and adults! I recommend pouring the smoothie into a bowl and leaving it in the freezer for half an hour or so to firm up into “ice-cream”, then decorating with a swirl of my Raspberry Chia Jam and a sprinkle of Homemade Granola and eating it with a spoon for a real treat! 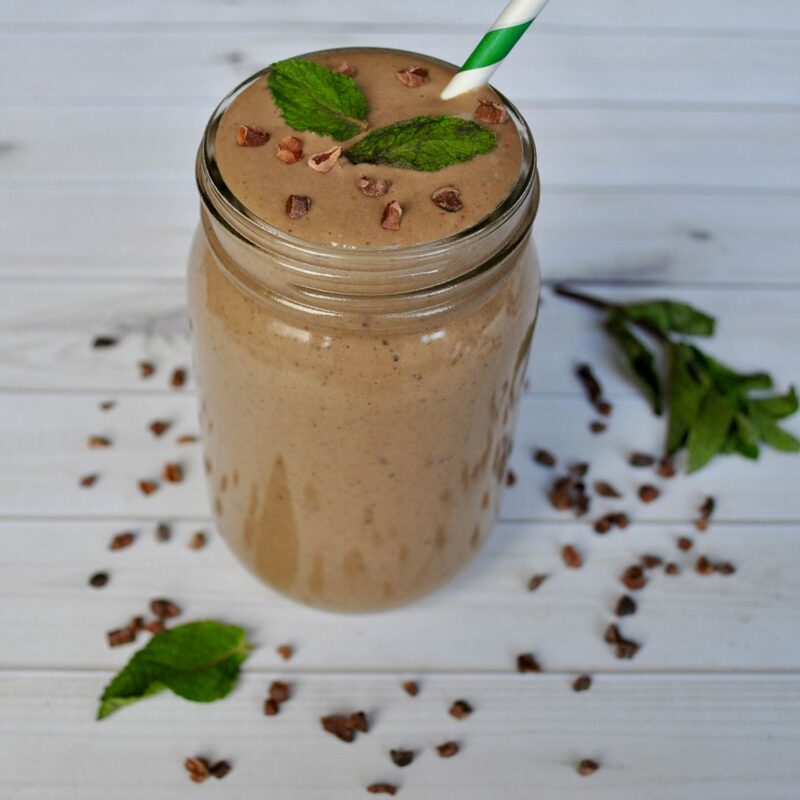 Be sure to take a look at all my other (vegan) smoothie recipes on the blog, like this Vanilla Mocha Milkshake, these Top 3 Green Smoothies, this Mint Chocolate Chip Smoothie and this Chocolate Peanut Butter Cup Milkshake. 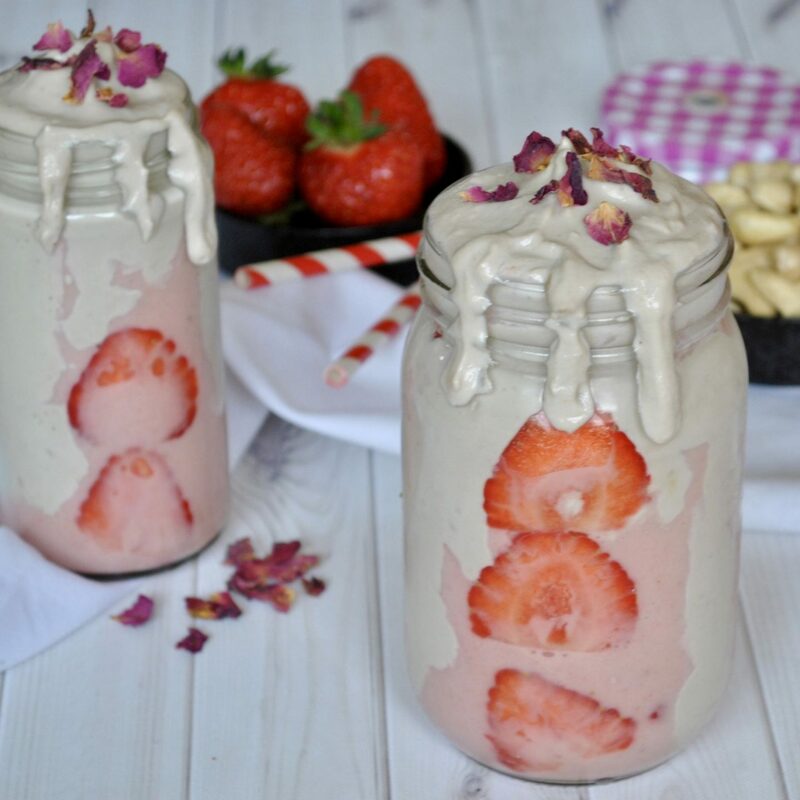 Place all ingredients except the strawberries in a blender and blend until smooth. Feel free to add a little more milk if it’s too thick until the desired consistency is reached. Set aside half of this mixture in a glass. Add the strawberries to the blender and blend again. Layer both smoothies into two glasses, decorate as desired and serve immediately. With Easter coming up, we’re surrounded by chocolate bunnies and creme eggs left, right and centre. 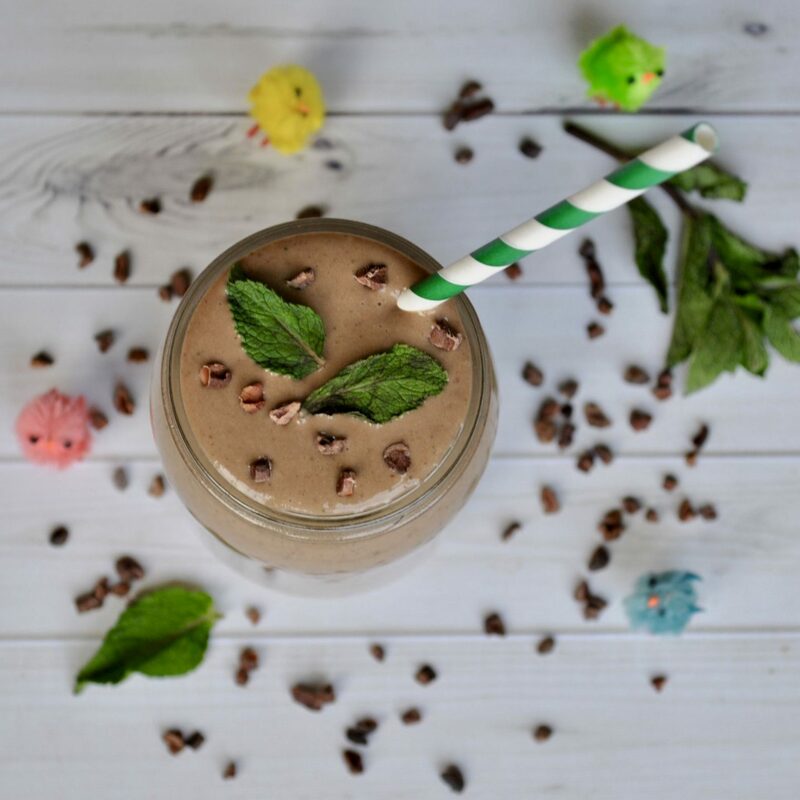 Why not swap the classic chocolatey treats in favour of this Mint Chocolate Chip Smoothie? 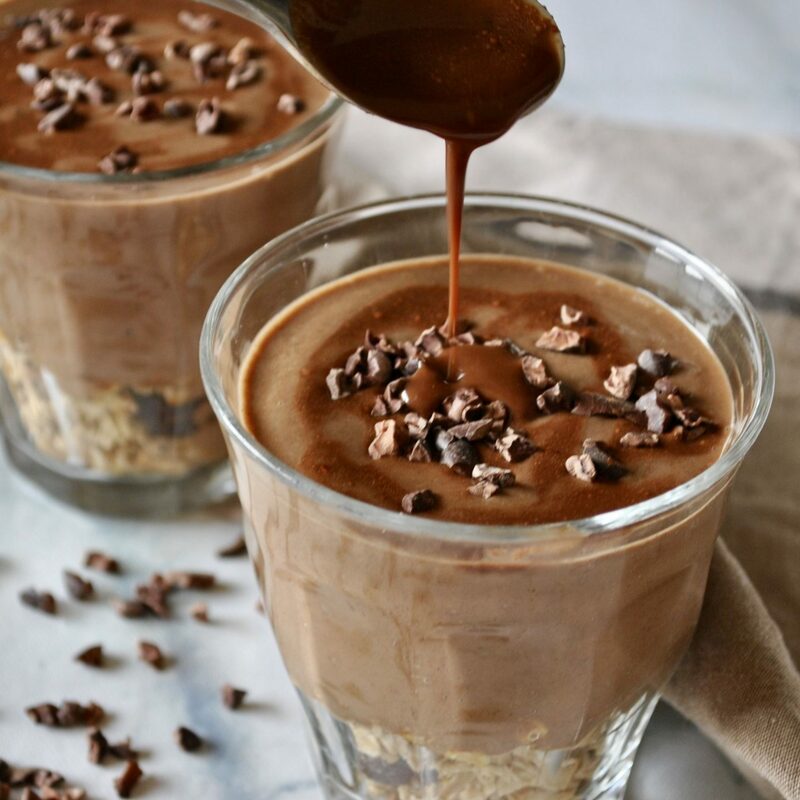 It’s just as indulgent as my Chocolate Peanut Butter Cup Milkshake but with a fresh minty twist! 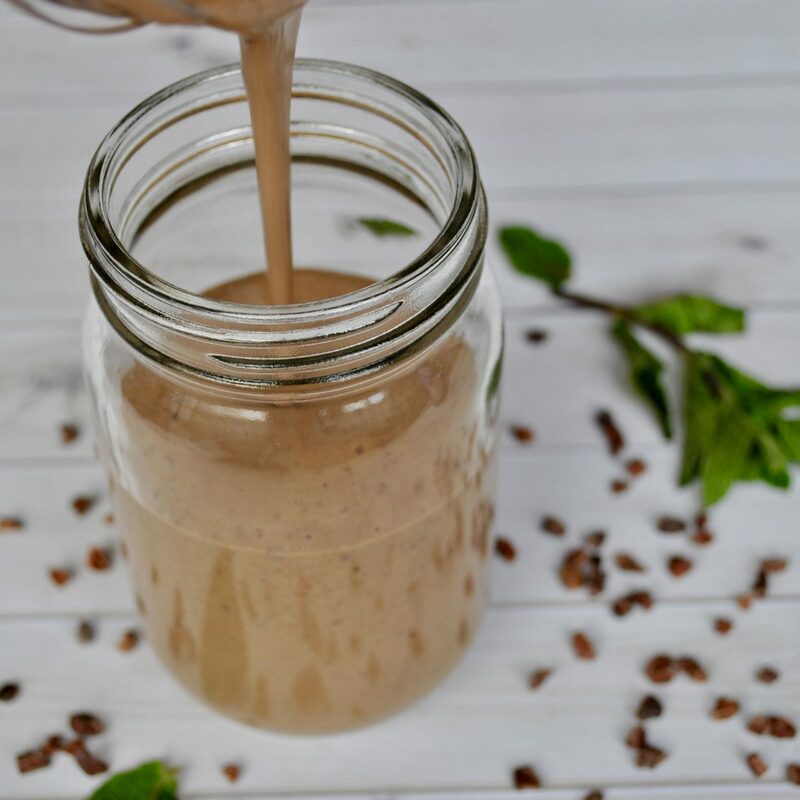 Its rich flavours come from cacao nibs, raw cacao powder and a couple of drops of peppermint essential oil, while the almond butter, frozen banana and a small amount of avocado give it an incredibly creamy consistency. 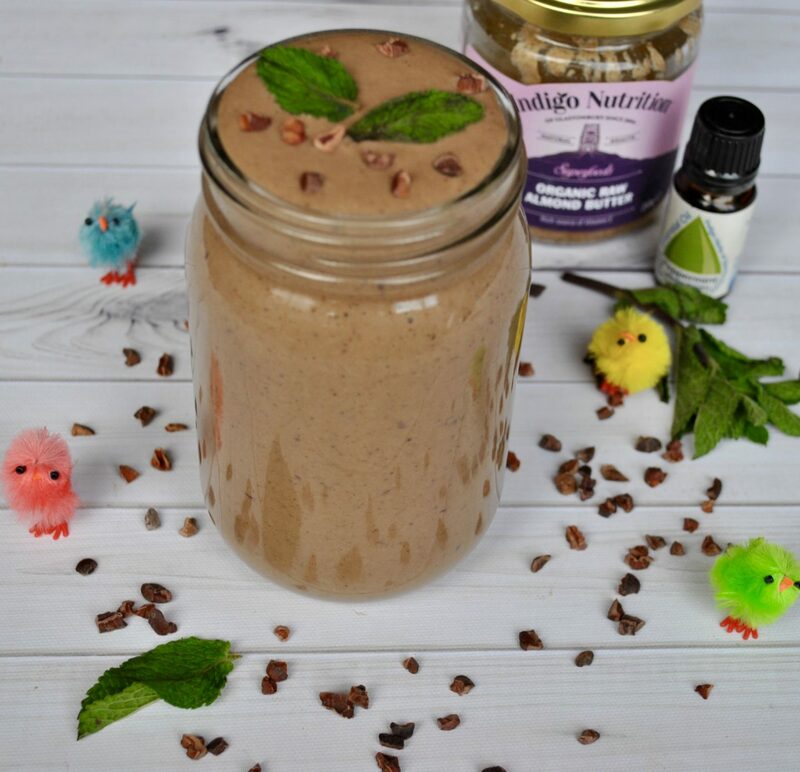 For more smoothie recipes, check out my Top 3 Green Smoothies, Chocolate Peanut Butter Cup Milkshake and Zesty Passion Fruit Smoothie Jar. 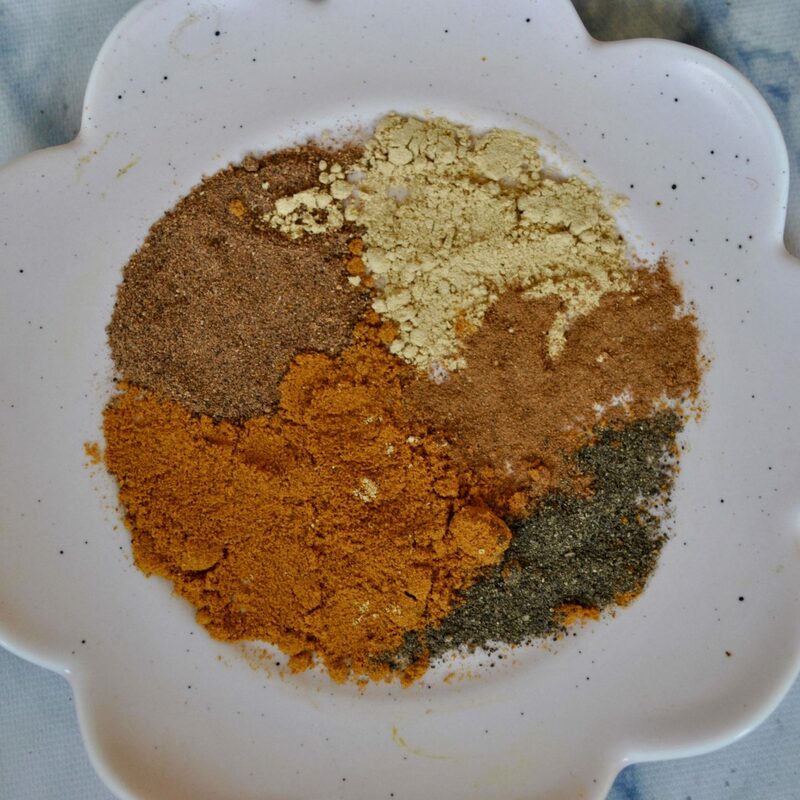 This recipe was developed in collaboration with Indigo Herbs using their products. 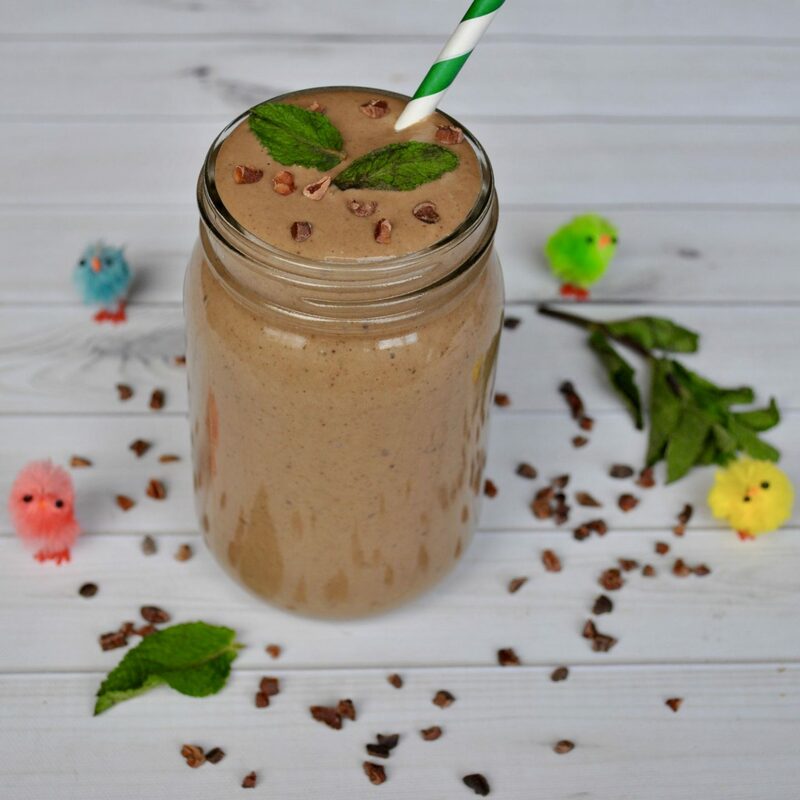 Add all ingredients, except cacao nibs and fresh mint leaves, to a blender and blend until smooth. Stir in cacao nibs with a spoon, pour into a glass and garnish with fresh mint leaves and more cacao nibs before serving. If you give this recipe a try, don’t forget to tag me on Instagram @cerealandpeanutbutter – I LOVE seeing all your recreations!